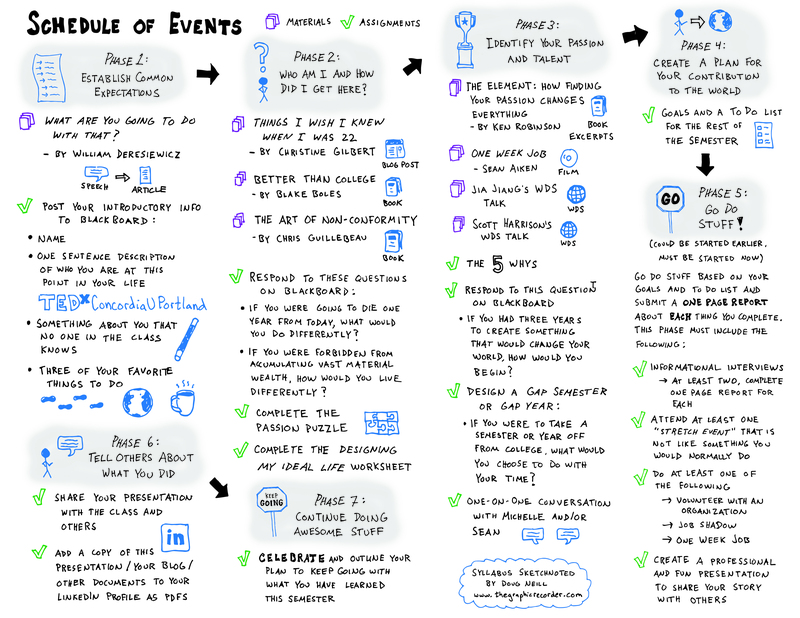 A few months ago a unique request came my way – a request to sketchnote the syllabus for a college business course. 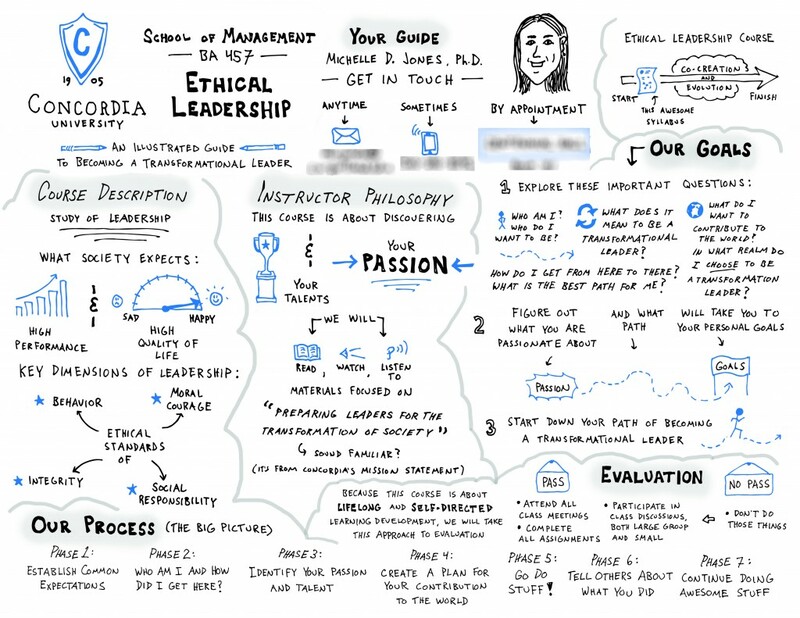 Prior to this request I had sketchnoted individual classes of a college course (usually an online course), but never the syllabus that spans an entire course and encapsulates the big picture as well as the details. NOTE: If you want to get in touch with the amazing students that are taking this course regarding internship or employment opportunities, send me an email (thegraphicrecorder@gmail.com) and I will put you in touch! 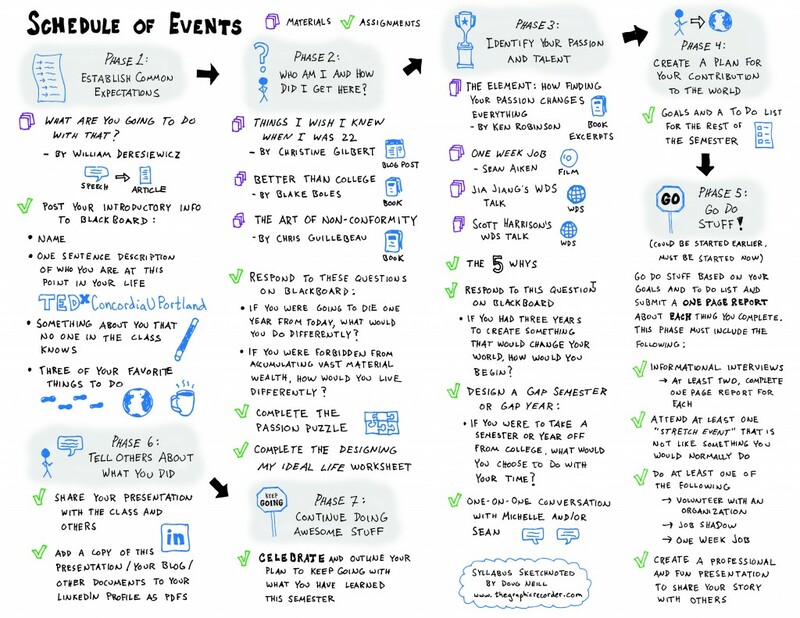 I took a slightly different approach with this sketchnoted syllabus compared to the other sketchnotes that I have posted to this site. Normally, the sketchnotes that I post are simply scanned images of my penned sketches that originate in a Moleskine notebook. In those cases, the only digital editing that I do is a bit of contrast adjustment to really bring out the dark strokes of the sketch. 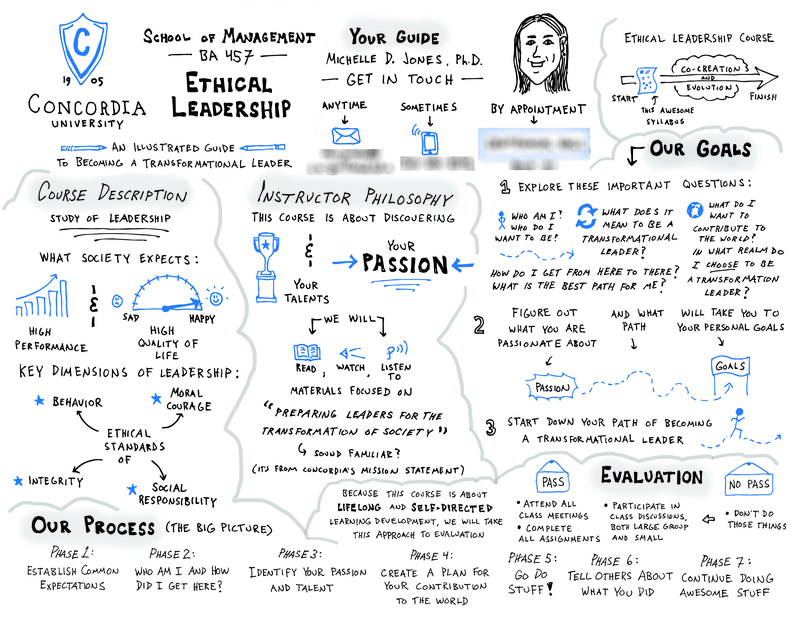 For this sketchnoted syllabus, however, I took a much more digital-heavy approach. All of the words and sketches that you see in the final images originated in my Moleskine notebook, but after scanning them in I vectorized my sketches using the process that I learned in Sean McCabe’s Skillshare course Digitizing Hand Lettering: From Sketch to Vector. I then compiled and colored my sketches using Adobe Illustrator. Since all my sketches were already in vector form, I had the ability to move around, resize, and change the color of any individual element of the sketch. In that way I was able to take what started as individual sketches spread across a number of Moleskine pages and compile them into the final two print-friendly-sized Illustrator documents. I spent a lot of time tinkering with the sizing, layout, and coloring of the elements, but that extra time gave me a lot a flexibility and ultimately resulted in a more polished end result that still has the hand-sketched feel that I love. Though I enjoy going straight from sketch to scan to publish, I have found that I also like to see what is possible once you start digitizing the sketches and doing some post-editing. It’s a process that I will continue to experiment with. If you’ve got a project that might benefit from visualizing ideas in this way, be sure to get in touch!